' Sunshine Sunday - True Love - Sisters, What! Does anyone else really struggle with this? I know I do. But here is the cool thing. The moment that I do I feel so empowered, I feel happier than ever. And I'm not just talking about romantic love, I'm talking all love. Love for your mom, dad, sister, friend, anyone. We live in a world that kind of teaches us to just think of ourselves. Watch out for # 1 mentality. Let me tell you as someone who has plenty of moments with that mentality it is EXHAUSTING! Focusing on myself all the time is so tiring. I remember in college when I'd call home with some big problem my mom would always say, "well looks like you need to go out and serve." Honestly, I hated when she'd say this because I knew she was right but I was just "too busy" to think of someone else right now. But whenever I would heed her advice my life changed. My problems seemed to solve themselves and I found myself a new friend. Now I'm not saying let yourself go and don't take care of yourself at all. Of course it is important to take care of ourselves, but I think an important part of taking care of ourselves is loving and serving others. 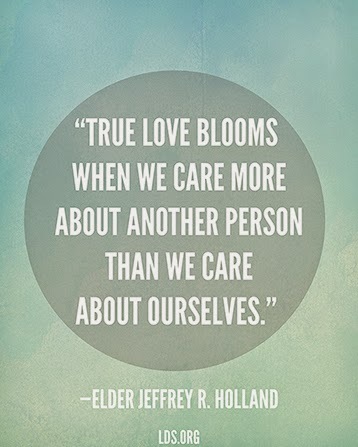 So lets start caring about others more than ourselves. In the process we will find ourselves, and we will make this cold, hard, sad world a much more beautiful, happy place. Stay awesome and happy Sunday! God will always take care of us while we're taking care of others!